So here is Arlecchina!.. one of the characters of my thesis based on the Venetian Carnival theme. so of the 3 characters I did.. these was the most complicated and challenging overall to do, as it had alot of details, as well as making the face was challenging to get and get a good topology as well. The Concept was done by my friend Robert Barros (can check his work on the links)and the modeling was done by me in Maya using Polygons only.. but switching back and forth with the interactive subD preview to see how the smooth will look like. There are some details that I could have done using textures.. but it was fun to model for the challenge. Certainly in the near future.. I will texture it and add extra details like folds and some patterns.. but that will be for a near future. for now enjoy the actual model. Any suggestions are more than Welcome! thanks enjoy! So here are the Wireframes for the War Galley I posted before. it was modeled using mainly polygons, but i used nurbs for the initial modeling of the hull of the ship and also for all the rigging. also I am planning to add more details that are missing after gathering newer information from my trip to Europe where i was able to get most of the references for missing pieces.. and also I have a much broader knowledge of why they had certain things on the ship as well on how the sails worked and were put together in real life. Hi guys!.. here are a couple of props I did for Resistance 2, while I was doing my internship these past summer at Insomniac games!. 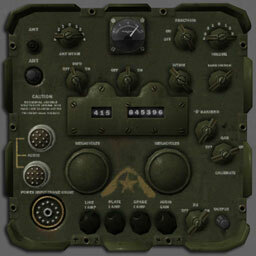 So here is the Iceland Hut Radio I did for the game. I modeled It based on an image provided to me and did the UV mapping, texturing of it! I got to use Parallax map for the first time while I was at Insomniac. (really cool to see the effect of Parallax on the model in real time while tweaking It up)It is like pushing the normal maps a bit further into more of a 3D Illusion. For the Stove I did the research of it by gathering many pictures of stoves of the 1950's era and modeled it from those pics. I also did the the UV mapping and texturing of it. In which I did a set of textures for color, Normal, specularity and Parallax(even thought i didn't put it on the pic). 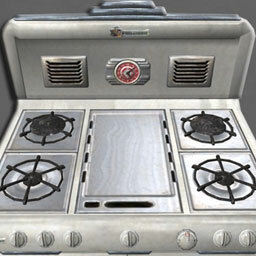 for the rest of the stove, I did a tiny white tile texture in which we used overlay texture and detail textures of dirt, for the rest of the stove. as well as the use of Steve's shader for the other metal pieces that don't appear on the textures I did. Also I wanted to give special thanks to Yancy Young for mentoring me, and helping me out in learning the proprietary tools necessary to get the models done properly and providing feedback and Fun while I was working there. also thanks to rest of the environment team and all others who made that summer a fun experience of learning and working while still having fun! So here is some new renders I did of my first Ship the Ingernmanland.. but these time around I used Mental Ray to render it instead of the regular Maya Render. Also I used Ambient Occlusion pass and composited against a digital Matte painting of a sky and ocean.. quite happy from the results considering was my first time painting an ocean.(sorry.. no ripples splashing against the ship yet) i will have to Paint them on the future. Also showing in here I have some screen captures of the footage of a Matte Painting I did last semester for my class. it can bee seen a frame of the original footage, then on the next pic with the green area which is the mask area were no changes take place and where the action goes. and on the last but not least is the final comp. it does look like a very simple Photoshop job.. but damn.. it was challenging to get some pictures that I could use on it and with similar values to the background plate. also the color correction was pretty hard to pull as well as many minor details.. including actual painting of small gaps. it was until the very end that I added the blur to the images and a bit of grain that the matte painting came to look like it was part of it. I am quite happy with the end result! I learned soo much from these class!! soo glad i took it. War Galley / Galera / Galere! I am really proud to show these Galley (Galera, Galere) model I did from scratch in 3 insane weeks of work toward the end of my last semester... and yes if you are wondering i was like a zombie for those 3 weeks, but it paid off in many ways besides the obvious fact that I got a new model! It also was the learning experience that I got from working on a tight deadline as well as problem solving and trying to figure out things to make these ship as accurate as possible despite the lack of enough reference to figure out the rigging and positions of the sails and the way they work and look as believable as a real Galley would be on the Mediterranean sea. These is a Work in Progress as I have to add more details and missing things! 2 weeks after I finished these renders In August of these year I went on a trip to France and Spain where I visited 3 amazing Maritime Museums that had not only great info of the Galleys, but they had in Barcelona a real life size replica of the famous Galera Real de Don Juan de Austria!!! also I was able to take Tons of pics for reference, I bought the Blueprints for it! (i have to figure out a way to scan these bed size blueprints. these is the work in progress of my Venetian Galley model. And here are a few pics from my trip where i gettered a lot of reference and information that will help me finish these model with all the major details on it. La Galera de Don Juan de Austria miniature model. Front of the Life size Galley in the Museu Maritim de Barcelona! and now from France I have these pics from the "Le musée national de la Marine" which had a scale model of the La Reale and life size decoration of it! very Impressive!! as well as some amazing collection of ships miniatures with some insane details! there was another Great maritime Museum in Madrid, but unfortunately there was no picture allow. also now that I have all these great materials I can finally finish these Galley the way I want it!! Wo0t WoOt!! It has been an awesome experience in soo many levels!. I have been learning a lot of new things, working a lot, while having a lot of fun at the same time! One thing that I have learned is that there is a lot of things that goes on, into the making of a video game!. Certainly much more than what I thought!. Here is the trailer that was shown at E3! for "Resistance 2" video game which is the game we are finishing up right now. Also I am really glad to have the opportunity, to be working at the moment with such an awesome group of people that makes Insomniac games! Here is a preview of the work in progress of my thesis. Which I am showing Arlechina! one out three characters that I am working on. these is a work in progress of it, which also shows a bit of the approach I took to model and do the character up to these point. on these particular character "Arlechina", the concept art was done by my friend Rob! You can check out more of his work on his blog. Which you can browse on the links! At last a new update!! So i will start with the Gondola I was working a few months ago, which has all the modeling done, but still need to do a few more details with normal maps for the extra details en decoration. So these Gondola Model is part of my Thesis project, that is based from the Venetian Carnivale Theme that I am doing!. These is 1 out of 5 pieces that my Thesis consist of. The other ones are 3 Characters and 1 environment (Dodge Palace)which you can see the WIP on previous posts. Soon there will be more posts and a few cool surprises that i can't wait to say! whoohoo!! getting ready for my first GDC! woot wo0t! uff it has been a lot of work these past few weeks working on several different projects for all 4 classes that i am taking currently as I am working on my thesis project and finishing texturing my airplane for my portfolio, which has been a headache to do, but hopefully it should come out good once is done... lets hope! So here is a preview of what I am working on the environment for my thesis project! wireframe pic of part of the column of the Doge Palace from Venice that I am working on. Here is a render test preview of a corner of the wip of the Doge Palace! Funny enough it kind of looks like a postcard! and hopefully i can get and Internship for the summer! that will be awesome!! see ya until next time!. It was about time for me to put something up! is already 2008! , A big year ahead for me to accomplish several personal milestones. Among them to Finish a new Demo Reel for GDC to apply for summer interships and with the hope to get one. Also finish some of my work to have it ready for the AAU spring show, and most important to finish everything from my thesis project on time is a must! So I can have it ready to apply, by the end of the year and then get ready for Graduation!!! w00t woot! so here is a WIP of some of my thesis project! in these particular one is a Venetian Gondola! part of the decoration of the Gondola. Also not everything has been just work... also a bit of vacation helps a lot to relax as well as get new ideas for things to do! here are some pics from Isla Iguana in Panama, where I come from(not the island, but the country) from these past weekend!! it was awesome to visit these small island, and get a lot of pictures for fun, reference and textures, trying out these amazing little camera I got, a Nikon P5000! which has been marvelous for taking some pretty good images.. as you can enjoy now..
Isla Iguana!... can you find the monkey! Me.. in the jungle of the island! Hi Everyone!!! I am Alfredo, a 3D modeler who just finished my studies at the Academy of Art San Francisco these past December of 2008. I am currently working on new pieces for my demo reel to start applying for jobs on the game and movie industry Thanks for passing by and hope you enjoy!